Queen Avocado Growing in South Florida, B Flower, G X WI Hybrid ? Queen Avocado. From epicenteravocados.com . This is an old Guatemalan variety introduced in the US in the early 1900's. Many Guatemalan varieties were introduced back then. But as new varieties more suitable for commercial production were introduced some of these faded away. The Queen seems to have hung around. Many of these guatemalan varieties were also introduced in South Florida at the same time. I don't see anyone growing any commercially in the area. "This queen of avocados owes its name to both size and flavor. Simply said, the 20 to 30 ounce pear shaped fruit contains a very small seed and flesh rated as excellent. At a recently held avocado tasting in Santa Cruz, California, when the Queen was halved and held up to the audience for display, the result was first a long hush and then wild applause. 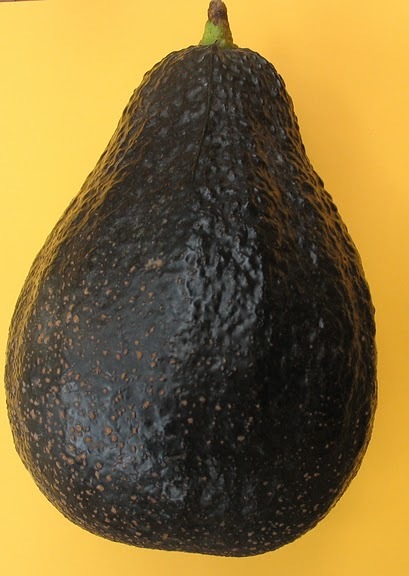 And well deserved: the avocado was both enormous and delicious"
"Queen: A grand fruit: pleases everyone who ever cuts in under its rough exterior, and beholds its beautiful interior. Tree very irregular in its growth, and prolific in sucker growth. Sets a fruit for every bloom, which fall not long after setting, leaving very little fruit to mature. For past several years they seem to be holding more fruits, and this year, they all had fairly good crops, of large fruits, but the most of them came off in two windstorms, this past winter. All orchards should have the Queen"
I just got a tree from I have no idea were. It was listed in Amazon.com. It did struggle for a while but seems to be growing now. I also was able to graft into a West Indies root stock for insurance. That also seem to be doing well. I will top work a tree in January 2013 to speed the process. I'm not expecting a miracle since the 100% Guatemalan varieties don't do well here. The Queen comes from Antigua Guatemala which is 5000 ft above sea level. I'm at 8 ft , so may be, they will fry in August. December 26, 2012: The tree survived our very hot, wet and humid summer. There is hope. The tree grafted on May 28, 2012 on WI root stock is also doing very well. I may not have a tree to top work this variety on this year I had to give priority to other varieties with more commercial promise. I'll continue to grow it in pots. August 21, 2013: The tree looks good, growing well. See picture. February 14, 2014: The tree looks good. It may be pushing flower buds and leaves, not sure. Probably we'll get both on the first year. March 12, 2014: The tree has flowers in the lower 1/2. Since I prune it late in the season to shape it it is just flushing leaves on top. It may set fruit. April 17, 2014: I see 2-3 fruits the size of peas, may or may not carry them to maturity.The tree is growing very well. May 26, 2014: The fruit still holding so we may get to taste it this year. July 12, 2014: I went by the tree today and saw 3 fruits hanging. To my surprise they are cukes. Very strange to have 3 cukes close to each other, probably seedless. I could not take a picture because the irrigation was on, will do next time. July 16, 2014: Well here is the picture of one fruit. The 3 hanging in the tree are the same. They look like cukes, without seed. Very strange for the 3 fruits to be set in the same way, or maybe this is how the Queen looks while growing. February 26, 2015: The tree is doing well I did not get to taste any fruit last year. Only set a few that mush have drop to be food for local wildlife. Now on its second flowering season. The tree is in good shape to set some fruit. Buds are swelling an soon it will flower. April 14, 2015: Almost done with the flowering. I see some BB size fruit not a lot. May 16, 2015: I see some fruit not a huge amount. I see a lot of dukes, there were some last year. This tree seems prone to it. A few fruit larger but I/m not sure about the small ones they can be cukes and fall off like before. I did see a "twin" avocado on this tree, never seen one before. See today's pix. August 2, 2015: I'm not surprised the fruit in this tree is doing so bad. There are some cukes hanging in the tree but the others looks very strange, like the fruit is not developing well at all.Our near sea level location is not agreeing with this tree at all. This may be the last update. Definitely not for our area. In this long video Julie Frinks talks about the Queen Avocado a few times.